■ Submental region: Four incisions - two in the submental area, two on the earlobes. ■ Upper arms: Lateral condyle and ventral muscle belly of the biceps muscle. ■ Breast: At three o'clock laterally, at six o'clock caudally where the collections of fat protrude. ■ Upper abdomen: Three fingerwidths caudal to the costal margin on each side. ■ Hips: Four incisions divided between the individual quadrants. ■ Lower abdomen: Four incisions, two in the bikini area and two at the level of the navel half-way between the iliac crest and the navel. ■ Lateral side of the thighs: Three incisions, one below the trochanter, one at the lowest point of the collection of fat and one in the gluteal fold. ■ Medial side of the thighs: Two incisions, one incision midway between the inguinal region and the knee at the lowest point of the collection of fat and one dorsally in the gluteal fold. ■ Knees: Two incisions located cranially and caudally to the fat deposit. ■ Calves: Four incisions. Two lateral, two medial. ■ Ankles: Three incisions. Two dorsal (caution: Achilles tendon! 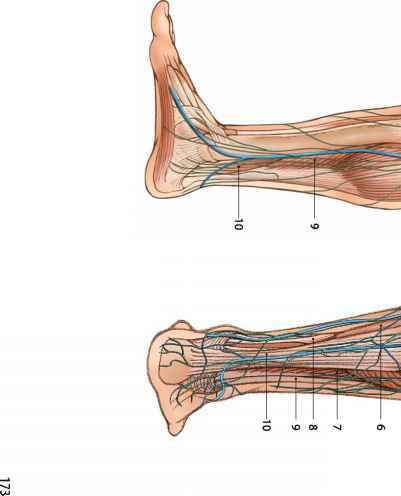 ), one ventral at the area of attachment of the tibialis anterior tendon.